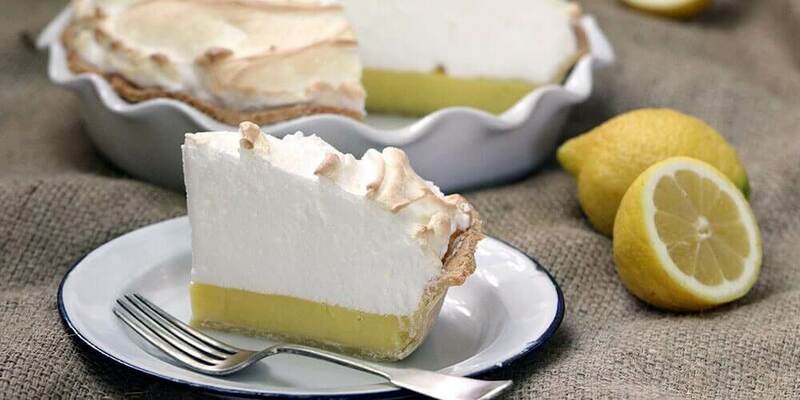 Ahhh lemon meringue pie; so springy and refreshing… and normally so loaded with sugar and calories. This Sola version tastes identical to the traditional edition, yet packs a small fraction of those traditional calories! Prepare the sweet pastry dough according to recipe instructions and roll out into a 10-inch circle. Gently place the dough into an ungreased 9-inch glass or ceramic pie plate and press firmly against the sides and bottom. Prick the bottom of the dough with a fork several times and then place it into the freezer for 30 minutes. Place a layer of parchment paper over the bottom of the pie crust, fill with uncooked rice, and place in the oven to bake for 10 minutes. Remove the parchment and rice and cook the crust for another 10 minutes, until golden brown, then let cool. Make the filling: Place all of the ingredients except for the egg yolks into a saucepan and mix well. Bring the mixture to a boil, whisking continuously, then cook for a further two minutes until the filling has thickened. Place the egg yolks into a large mixing bowl and whisk until smooth, then pour the pie filling mixture over the egg yolks. Whisk the mixture thoroughly and pour into the cooked pie crust. Reduce the oven temperature to 325F/165C. Make the meringue: Place the egg whites and cream of tartar into the bowl of a stand mixer fitted with the whisk attachment (or use an electric hand mixer and a large bowl) and whisk until light and fluffy. Slowly add the Sola® sweetener while the whisk is running and continue to mix until smooth and glossy. Add the vanilla extract and continue to whisk until the meringue reaches soft peaks. Spoon the meringue mixture over the hot lemon pie filling, making sure it goes right up to the edges. Place the pie into the oven to bake for 12 to 15 minutes until the top is a light golden-brown. Cool for at least an hour before enjoying, and store in the refrigerator.